“When I first thought about hair restoration, I thought, ‘is it going to fall out if I do something active—if I go on roller coasters, or if I am in the water?’ So, having gone through this procedure and seeing the results—it’s the same as my natural hair. It IS my hair, so it doesn’t fall out. I don’t have to worry about it. I don’t feel self-conscious getting in or out of the water. 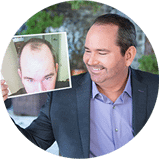 It’s put me back to that very natural state that I was in before I noticed my hair loss.” – Blair T.
Bosley hair transplants can help people experiencing virtually every level of hair loss. “I know the doctors at Bosley are exceptional. If you’re going to do it, why would you go anywhere else? You want to have the best.” — Lance S.
“I have never experienced such wonderful customer service. They were all focused on my comfort throughout the procedure.” – Jeff B. “I was actually pretty young when I started losing my hair. It happened rapidly. Even though I never let my hair loss dictate my life, it was always something I thought about. I can’t explain to you the way it made me feel to wear my hair down, to go out on a date and have confidence again and know that when I met somebody for the first time, they weren’t looking at my hair—they were looking at me. For me, that’s extremely valuable. It’s real, it’s mine and nobody can take it away. Thank you, Bosley! — Michelle L.
“Bosley was the best investment that I ever made. It gave me my confidence back. When I go out, I don’t wear a baseball hat. I don’t do any of that anymore. I don’t cover my hair. I don’t try to stay inside. I just go out—I have fun.” – Joshua A. *Conditions apply. Please see Terms & Conditions for full details.